One layer of virgin "Malden Mills" 200 weight polar fleece with a finished edge. For a stay-dry layer; not for absorbency. Made in USA. One layer of virgin "Malden Mills" 200 weight polar fleece with a finished edge. Line your cotton diaper with this top quality polar fleece and obtain dryness next to baby’s bottom since it allows the moisture to go through it but it doesn’t feel wet. It really works. No long term studies have been done using polyester fleece next to baby’s bottom, but it seems to us that it’s got to be safer than chemical filled throw away diapers. Many moms have used this material in this way successfully for years. 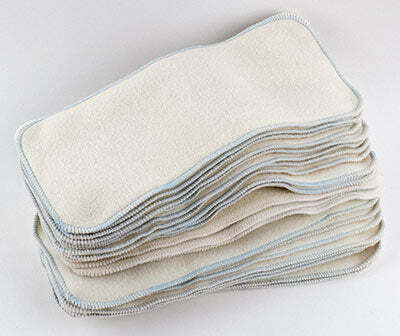 Use these for a dry feeling when the additional absorbency of the Stay-Dry Doublers is not needed. The color of these is off white natural. However, like ALL polyester fleece products (stay-dry pocket diapers would be included), the fleece is dyed. The white kind is dyed and the natural, off white color ones such as these are also dyed. We stock either white or off-white depending on availability. To the best of my knowledge from conversations with fleece manufacturers, all polyester fleece is dyed. There is no undyed stay-dry fleece. If you discover this is incorrect, please let me know right away, but my research does confirm this disappointing fact. These do meet the CPSIA requirements (Consumer Product Safety Commission laws) for not containing any lead in the dyes. 5 inches wide by 12 inches long. 100% polyester fleece. These are intended to provide a stay-dry layer next to baby's bottom over a cotton diaper, or other absorbent diaper such as hemp/cotton or bamboo rayon blend diapers, but are not for use in pocket diapers. They do not provide absorbency but just provide the stay-dry feel of a quality polyester fleece layer. They provide a layer of polyester fleece for the pee to go through but then act as a stay-dry layer keeping the wetness in the cotton underneath the fleece. Made in the USA. The Malden Mills liners are sometimes out of stock because we have just one person sewing them and they sell so quickly that we just can't keep them in stock consistently. Just enough to keep her bum dry and rash free! I’ve been using these for my toddler who still wears a night time diaper. Her skin was getting very dry. This was just enough to keep her bum dry and rash free! These are so much softer than any polar fleece I have found at the fabric store. Very cushy, can’t wait to use them for the first grandchild. Before we had these inserts, our baby had diaper rash with cloth diapers. After using these inserts, his skin does even better in cloth diapers than in disposables. Good quality, poop cleans off easily, highly recommended. These are my favorite stay-dry liners, and also happen to be the cheapest I've found. They're much thicker than the cotton babies brand (could be a pro or con). Best of all is that they come out of the wash looking like new, keeping those bf poop stains off the prefolds. Baby couldn’t last 2 hours without a change. Adding these plush liners helped me extend her nighttime hours and kept her dry ( except for the leg area). They do pill but I don’t care kept her bum dry !